Officer Daniel Carter stumbles into a waking nightmare when a routine patrol turns into something far more hellish. After taking a blood-drenched to a hospital, he discovers that the hospital is home to something sinister and something that has to be stopped at all costs. You’ll probably recognise the names of directors Steven Kostanski and Jeremy Gillespie from their film company Astron-6, which prides itself on crafting the maddest, bloodiest and most splattery horror-comedies it can. However, with The Void the pair take a step away from Astron-6 to create something far scarier and more monstrous, but still choosing to inject a certain amount of wit and humour which covers the film loosely under that Astron-6 umbrella. The Void is a bold, brave and courageous feat of independent cinema that proves you don’t need big bucks to create something that bursts with ideas and creativity. Kostanski and Gillespie channel their undeniable passion for horror into a film that is impossible to describe, but one that is possibly one of the greatest, ickiest and most unique features you’ll ever see. It has undoubtedly been inspired by horror cinema from the ’80s and Lovecraftian storytelling, but The Void is its own unique beast and one that fights to avoid definition. There is an unmissable affection for the 1980s and films like Hellraiser and The Thing with The Void’s use of practical effects over CGI and its creature-feature centre. The film itself is set in an ambiguous period of time, but there is a polished and crisp finish to the film that levitates it towards modern day. The icky effects become more impressive and this allows the film to steer away from the more gritty style of film-making that can sometimes be associated with earlier features, suggesting the film’s desire to pay subtle homage, but not entirely rely on nostalgia or reference to achieve its well-earned place in the best of modern horror. Combined with an intense sound design and score, The Void is a relentless, nightmarish trip into the absurd and it’s a complete blast. There is a level of obscurity and ambiguity with The Void that will easily be hated by those that like solid answers to all questions a film may raise. The audience are placed in the same outlandish boat as the characters; as they struggle to make sense of the situation, so do we. Those who admire a film that leaves it audience as baffled as the characters within it will find The Void’s lack of explanation refreshing and an excuse to watch the film again and again. One day you will be able to piece together the puzzle and make sense of The Void’s overwhelming madness and intentional nonsense. People start to carve their own faces off, the dead start to rise in the form of gruesome monstrosities and all this is happening while hooded figures armed with knives lurk outside in the dark. 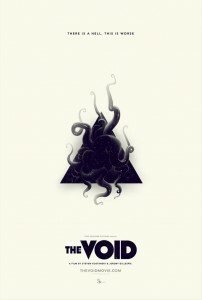 The Void digs deep into your deepest, darkest nightmares and thrusts the images of monsters that will make you cringe and cower, but also smile with glee at the film-makers’ confident and creative use of practical effects that ring back to the days of John Carpenter’s The Thing. There are monstrous beings lurking in the hospital and elements of Lovecraftian terror lurking in the film’s concern with playing god and messing with life and death. Beneath The Void’s obvious intentions to craft a film that is an utter gore-fest, lies the belief that films also need to establish an emotional connection to their audience. Even a tiny one. If you peel away the story’s outer layer of simple, but effective, shocks and hysteria, you’re still left with an insightful void filled with ideas concerning the complexities of grief and desperation. At the heart of the film there is a preoccupation with grief and the length’s one will go to be reunited with a lost loved one and it is the actions of a particular character – which involves a type of ritualistic, occult-like venture into otherworldly dimensions (I think) – that causes all hell to break loose. The antagonist and protagonist of the film are both driven by their feelings of anguish, thus the film becomes two very different explorations of what one can become after suffering a terrible loss. Aaron Poole brings sentiment and strength to his character Daniel who is quietly struggling with the break-up of his marriage and thrust into the role of the reluctant hero. He frequently bucks heads with the macho Vincent, played by Daniel Fathers who sinks into his role with ease thanks to his past with American actioners. They become an unlikely team, but one that is a ton of fun to venture into the abyss with. The Void is a dream for viewers who want to experience something utterly mental and beautifully dark, but also grounded in a devastating reality. The Void builds and builds, until we are greeted with its audacious and striking finale that can only be described as a descent into utter mayhem. All the iconography we have been subject to comes together into this unabashedly bonkers and disturbing climax where every idea is culminated in to one boiling pot of pure horror. It’s pretty damn wonderful. The practical effects continue to amaze, the film’s desire to be spectacular is achieved and, most importantly, it cements the certainty that you are going to leave The Void in a daze of wonder and adoration. The Void is a multitude of ideas and elements, homages and nods, but one thing is for certain: it’s a freaking joy and that is a rarity.